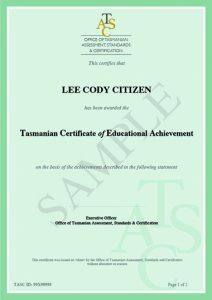 The Tasmanian Certificate of Educational Achievement (TCEA) is a quality assured certificate issued by TASC to eligible students at the end of their senior secondary studies. The TCEA is designed for students for whom certificates such as the Tasmanian Certificate of Education and the Qualifications Certificate do not provide an adequately just and fair account of their participation and achievements in their senior secondary years. Eligible students may include those who cannot meet the requirements for the TCE or a vocational education and training (VET) qualification as strongly as other students. If you think you may be eligible for the TCEA, please discuss this with the TASC Liaison Officer at your school/college. Before applying for the TCEA, please read the Guidelines: Tasmanian Certificate of Educational Achievement. This includes eligibility criteria for TCEA and what needs to be completed before applying. If you are unsure, then please speak with the TASC Liaison Officer at your school/college. Applications for the TCEA will open on Monday, 8 April 2019 and close on Friday, 5 July 2019. Later in the year, (if the request has been approved) the school submits the Descriptive Text detailing each student’s participation and achievements required for the final TCEA (late 2019). If you have further enquiries please contact the Office of TASC. © 2019 TASC. All rights reserved.